One of the greatest treasures of each Stroke Camp are the stories that are created. At the last Kansas City Stroke Camp, the story consisted of volunteers, stroke survivors, caregivers, and RRSC staff working on a specific project that resulted in a beautiful quilt. Not only did the quilt reflect the collaborative efforts of everyone, but also expressed the love that all the camp participants shared in making this special gift. Each attendee signed their name to a leaf, which was stitched onto the tree. This quilt project was the vision of Connie Johnson, who spent countless hours designing and sewing this amazing work of art. Thank you to Connie and all KC Stroke Camp participants for making this special gift that will hang on our office wall for years to come. 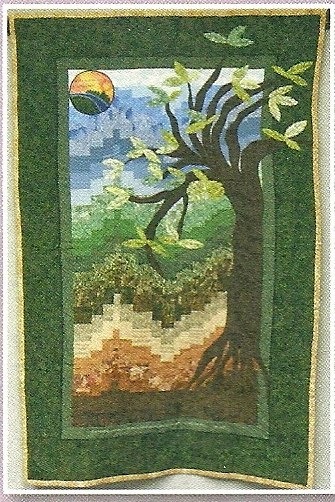 The scripture at the bottom of the quilt (which doesn't show up in the photo) reads: If a tree is cut down, it will sprout again, and its new shoots will not fail. Job 14:7. The Mission of Strike Out Stroke is to educate the public about the symptoms of stroke and need for immediate medical treatment. This campaign promotes “FAST” (Face, Arms, Speech, Time), which is the nationally-accepted symptom awareness program for national stroke organizations, emergency medical providers and stroke centers. In the 2014 Strike Out Stroke Awareness Campaign, over 700 volunteers supported nineteen Major League Baseball Events which had a live audience of 622,000 fans. Including 50+ Minor League Baseball Events and fans and broadcast media (TV and radio), over 1.5 Million people were exposed to the FAST lifesaving message. Strike Out Stroke™ is a national event-based campaign that designates one game in each selected market as “Strike Out Stroke Day.” Strike Out Stroke Management (SOSM) oversees all Events working with each market’s Local Organizing Committees (LOC) to provide direction, support, materials and media packages for the setup, promotion and execution of the Event. The LOC is made up of regional Comprehensive and Primary stroke centers, hospitals, first responders, rehabilitation centers, stroke survivors/caregivers and other stroke advocates. SOSM makes all contractual arrangements with the Baseball Club including date selection; associated promotional and recognition rights; pre-game field activities and in-game broadcast recognition and digital signage. In 2015 SOS is planning 22-26 Strike Out Stroke Events with Major League Baseball and developing local organizing committees in each of these markets across the United States. This type of national organizing entails extensive travel and experienced staff to manage and coordinate multiple events simultaneously. Additionally, the SOS Baseball Event is leveraged in each market to generate pre-event regional media attention to increase stroke symptom awareness messaging impressions. How easy is it to save a life? How much easier is it to save thousands of lives? Every year 800,000 people suffer a stroke in the United States yet the general public does not recognize stroke symptoms. Strike Out Stroke was created to address this severe deficit in public awareness. Because of the ongoing support of the Retreat & Refresh Stroke Camp Board, millions of Americans will learn the simple but powerful, lifesaving message about the symptoms of stroke and how acting FAST to call 911 saves lives. I always knew that something life changing was going to happen to me at age 40. I just felt it. On January 1, 2008, I had a massive stroke caused by an Arterial Venous Malformation in my brainstem. I was 40 years old, a free spirit, independent. I had just received my graduate degree and became a teacher . My passion was to educate children and inspire hope for our future. After a year of teaching, I started to have horrible headaches. Within 6 months I suffered the stroke. For years afterward, I had multiple brain surgeries . It was a long journey home. going. A work in progress is what I consider myself now. I don't focus on the past or the future anymore. I focus on the present. I think it's all in how we want to look at our stroke. Is the glass half empty or half full? I choose half full. It takes hard work every day to maintain a positive attitude. It is a meditation for me. I now accept what has happened and appreciate the new me. I don't believe stroke is easy for any one- of any age. Afte (years of recovery, I started volunteering in my community. I volunteer with stroke patients in the hospital, help tourists at the local chamber of commerce and tutor schoolchildren . I am very active in stroke support groups and public speaking events. Life was extremely difficult after my stroke, but I adjusted. I live in a great community and have many new friends. I couldn't do it without them. Since my stroke, I have learned to ride a three-wheel bike, make lampshades and take one day at a time. I start each day with a healthy dose of gratitude, laughter, kindness and compassion . It is my intention to make each day my best. I believe that anything is possible and I believe in miracles. In early January, I started searching online and found Stroke Camp. It sounded so interesting. I flew down to San Diego for the camp held January 23-25 because I just had to meet these incredible people that make it all happen. I want to continue my work with stroke recovery, prevention and education. I just simply want to help people. 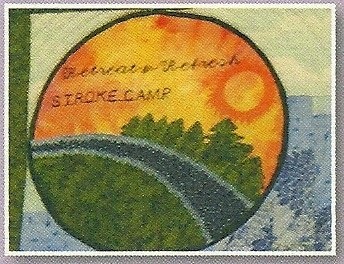 My dream is to see Stroke Camp come to Northern California someday. I believe "where there is a will there is a way." I can't give up until stroke statistics decline, until people stop dying and being disabled. I believe I can help to produce that change. At least I can try. So something big did happen to me when I turned 40. It was life changing and I will never ever be the same. For that I am grateful. I appreciate everything I have been given and have survived. After seven years of recovery, I just got my first job . I am beside myself with excitement for the future. Never give up hope and never stop trying. We all have something great to give.